Penn State has spent $59.7 million on costs related to the scandal involving Jerry Sandusky, who was convicted of child abuse. Penn State is paying the sum to 26 young men over claims of child abuse at the hands of former assistant football coach Jerry Sandusky. The school said 23 deals are fully signed and three are agreements in principle, but did not disclose the names of the recipients. The school faces six other claims, and the university says it believes some of those do not have merit while others may produce settlements. 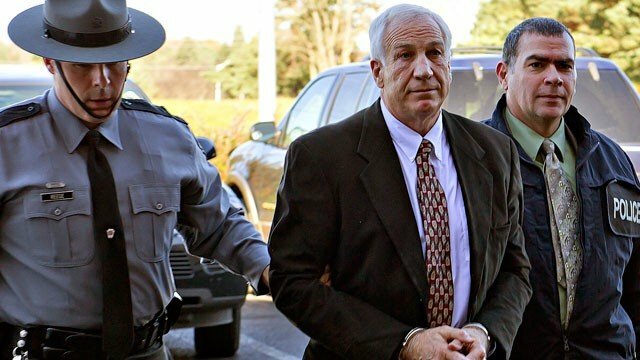 “We cannot undo what has been done, but we can and must do everything possible to learn from this and ensure it never happens again at Penn State,” said Rodney Erickson, who announced the day Jerry Sandusky was convicted in June 2012 of 45 criminal counts that Penn State was determined to compensate his victims. The settlements have been unfolding since mid-August, when attorneys for the accusers began to disclose them. Penn State followed a policy in which it has not been confirming them, waiting instead to announce deals at once. Harrisburg lawyer Ben Andreozzi, who helped negotiate several of the settlements, said his clients were satisfied. “They felt that the university treated them fairly with the economic and noneconomic terms of the settlement,” said Ben Andreozzi, who also represents some others who have come forward recently. Those new claims have not been presented to the university, he said. Penn State has spent more than $50 million on other costs related to the Sandusky scandal, including lawyers’ fees, public relations expenses, and adoption of new policies and procedures related to children and abuse complaints. It said Monday that liability insurance is expected to cover the payments and legal defense, and expenses not covered should be paid from interest paid on loans by Penn State to its self-supporting units. Jerry Sandusky, 69, has been pursuing appeals while he serves a 30- to 60-year state prison sentence. He was convicted of abusing 10 boys, some of them at Penn State facilities. Eight young men testified against him. Jerry Sandusky did not testify at his trial but has long asserted his innocence. He has acknowledged he showered with boys but insisted he never molested them. The abuse scandal rocked Penn State, bringing down football coach Joe Paterno and leading college sports’ governing body, the NCAA, to levy unprecedented sanctions against the university’s football program. "hard for me to see exactly what i look like"